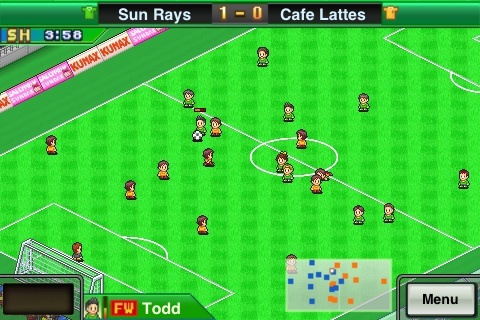 Pocket League Story by Kairosoft is an iPod Touch and iPhone app that puts you in control of your very own soccer league. In this game you have to manage your team, recruit players, build your reputation and get money and sponsors. In this review, which was made with an iPod Touch 3, we will go through all the good and bad so you can decide if this game is a good match for your device. 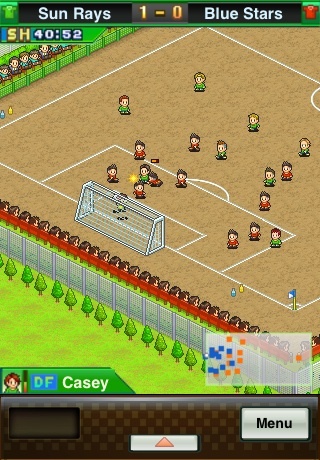 The graphics in the Pocket League Story application are 8-bit and they look wonderful. Anyone who likes the retro look, or anyone that likes simplistic looking games, so enjoy the graphics. The audio is similarly retro. It changes according to what you are doing, unlike some other apps that have the same song continuously play, so you shouldn’t get bored from the music. 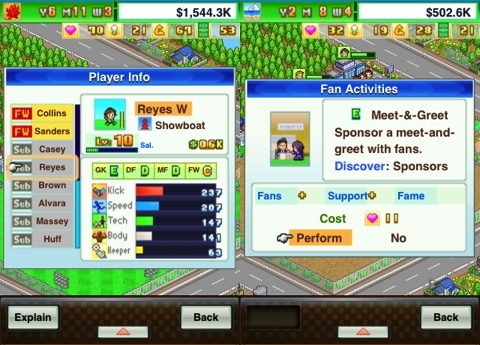 Most of the gameplay in Pocket League Story takes place outside of the stadium. You have to train your players to ensure they are good enough to go against better and stronger teams. You also need to recruit players, who will provide better support and a more well rounded team. Money and reputation is also required. Money is gotten mostly through sponsors, which will agree to sponsor your team if you can pay them enough for negotiations, or if your reputation is good enough. You can also get money by selling merchandise. If you are interested in managing a virtual soccer team, then Pocket League Story has a lot to offer in this side of the simulation. While Pocket League Story shined outside the stadium with all the things you can do with your players and team, it isn’t quite as good during the soccer matches. You have very little control over your players. Before the match starts, you can tell your players what strategy to follow, and during the match you can click a button to give your player an “aura” that increases their speed and strength. But, that’s it. You can’t control the players, you can’t tell them to pass or shoot and you can’t really do anything else. However, if you are more interested in managing the team, then this won’t be a problem. If there is one big problem with Pocket League Story, it’s that you can easily overkill the matches. After your reputation gets really high, you hire all-star players and really train your team, then you will easily win every stadium match. It’s actually a little too easy, and it takes the fun out of playing. Pocket League Story is a fun app that leans more towards managing a team rather than controlling it. While the soccer gameplay is a little lacking, and you can easily overkill the opponent after really training your team, this is still a fun app that you should get hours of enjoyment from. AppSafari review of Pocket League Story was written by Darius Reimm on January 24th, 2012 and categorized under Adventure, App Store, Fun, Games, Sports. Page viewed 4913 times, 1 so far today. Need help on using these apps? Please read the Help Page.